We pack and post same day for orders made before 1pm (NSW time. Excludes weekends & public holidays). Click the button below to add the CARNIVAL Face Paint KIT includes how to cards, brushes + sponges by Global Colours to your wish list. The Carnival face painter mini starter kit by Global Colours is a pro quality face paint set at an entry level price. We've combined one of our most popular mini face paint palettes, the Carnival palette by Global Colours, and bundled it with a set of "how-to-face-paint" cards, 3x quality face paint brushes and a set of 6x face paint sponges to create this awesome little starter kit, perfect for parties, face painting at home, a wonderful gift idea, or even launching your own rewarding face paint business on a shoe-string budget. It's ready to go when you are! So what are you waiting for? Backed by our 5-Star service and expertise, the Global Colours Carnival palette is ideal for beginners to professionals. This face paint set is a wonderful gift idea for any budding artist, guaranteed to delight! We recommend ages 8 and up; but with the help of an adult, younger children will also enjoy many hours of creative fun with this lovely face paint set. No previous experience needed! 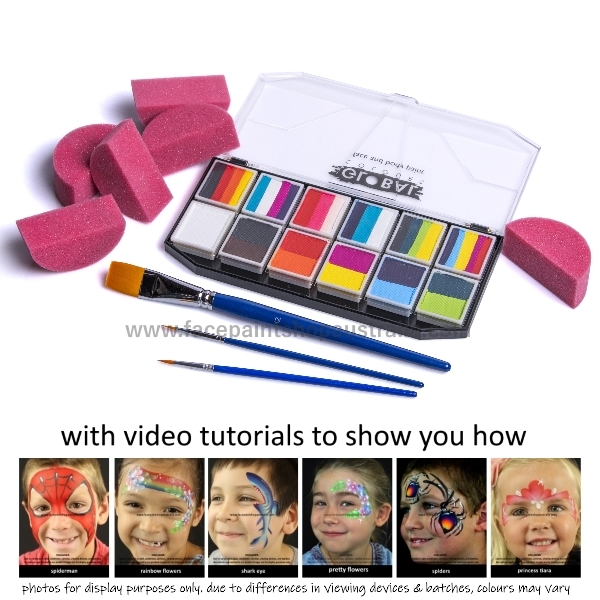 ✔ Includes a BONUS set of "face cards" with video demos: how to paint the most popular face paint designs, valued at $5.97! Global Colours Carnival face paint is for every body! And would be ideal for anyone on a budget. Whether face painting for fun, for fundraising, or for profit, this handy set of 10 colours plus 6 rainbow cakes is a great starting point, without compromising on quality. This is the same brand used by professional face painters. These products are not available in your local discount or general store. With so many options, this palette will give you the perfect introduction to the wonderful world of face painting. Activate with water and apply with a brush and/ or sponges. This palette is ideal for make-up artists, sports team supporters, parties for children, festivals and fairs. Water (Aqua), Calcium Carbonate, Acacia Senegal Gum, Glycerin, may contain: Iron Oxides (CI77491), Titanium Dioxide (CI77891), FD&C Yellow 5 (CI9140), FD&C Red 40 (CI16035), FD&C Blue 1 (CI42090), Ultramarines (CI77007), D&C Red 7(CI15850), Mica (CI77019) and non-toxic Fluorescent Pigments. Conforms to ASTM D4236. GLOBAL COLOURS is an Australian owned company with a world-wide reputation for quality and safety. With over 20 years of experience in manufacturing quality face paint and body art supplies, Global Colours is a trusted brand you can rely on. The Global Colours Professional Make-Up Body Art range is used by professional face painters and on movie sets worldwide. Global Colours Body Art was the official face and body paint for the Opening and Closing ceremonies of the Sydney Olympic Games.Global Colours Body Art is suitable for all age groups and a wide range of uses. This is a premium body paint make-up which, when activated with water, has a smooth creamy texture. It dries to a soft velvety finish and is available in a wide range of single colours with a regular (matt) or pearl finish. Also available as multi-coloured Funstrokes and Split Cakes. Made in China.